Anyone who works in an office setting and shares a refrigerator with their co-workers knows to write their name or initials on their food. Just in case. I did this while living in the sorority house because no one thought twice to take an egg from a carton that wasn’t marked and next thing you knew, you only have two eggs left. Not cool. That also happened with tampons, but let’s stay on course. Name or initials on your food – same goes for the work place. Unless it’s marked “community”. Those are the rules. It makes me laugh. 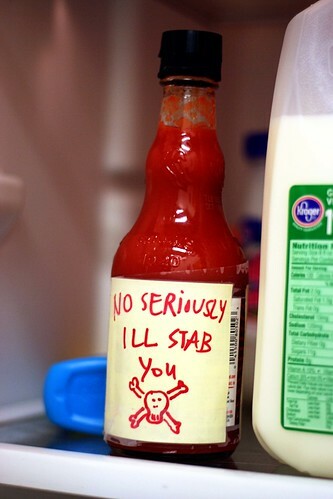 But I don’t use Amy’s hot sauce. For obvious reasons. The warning is clearly marked. 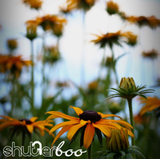 ~ by shutterboo on February 11, 2010. Haha that is pretty funny. Sounds like something I would do lol. I love working with creative people. No way could I draw a skull and crossbones that well. HAHA this Amy is hilarious – the real question is, did it work? It scared you away, but somehow I don’t think you were the offender in the first place. Ahh the house. Our can opener to this day has “JMG” emblazoned on the handle in sharpie pen. I love that can opener. I loved the 3 before it that were eaten by the house. At one point there was a juice drinker so bold as to drink my beverages even when they were labeled. LD and I (food sharers) had to strat marking the last known juice level with a permanent marker and our initials. Drink some juice? Mark the level and sign. *sigh* Some things I do NOT miss about the house.